I love coffee! Especially gourmet coffee! Haven’t I said that like a million times on Faith Filled Food for Moms!? I sip on coffee all day long, but my most favorite cups of coffee of the day are my first cup and my last cup. I can’t afford to go out everyday and buy myself specialty coffee drinks. So I’ve learned how to make espresso at home and enjoy homemade gourmet coffee drinks, like Lattes or Icy Coffee Milkshakes! 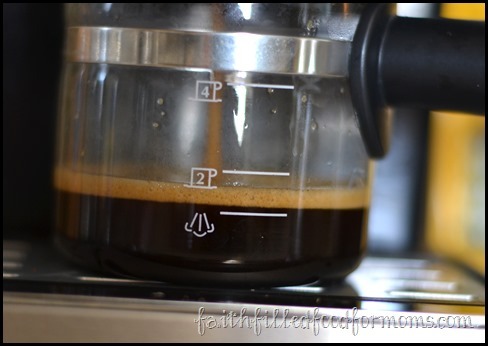 Years ago my daughter gave me a coffee maker that has a timer..brilliant! HA! So every morning when I get up..there it is..awww smelling so good and ready for me. Just waiting for me sip and relax for my very short time in the morning. How I love that! The second time of the day I love to enjoy my coffee is in the late afternoon. I make myself a special cup, a little different than the rest of the day. Many don’t like to drink coffee that late, but for me it’s the beginning of busy evenings with teens in sports, drama, church and so on. 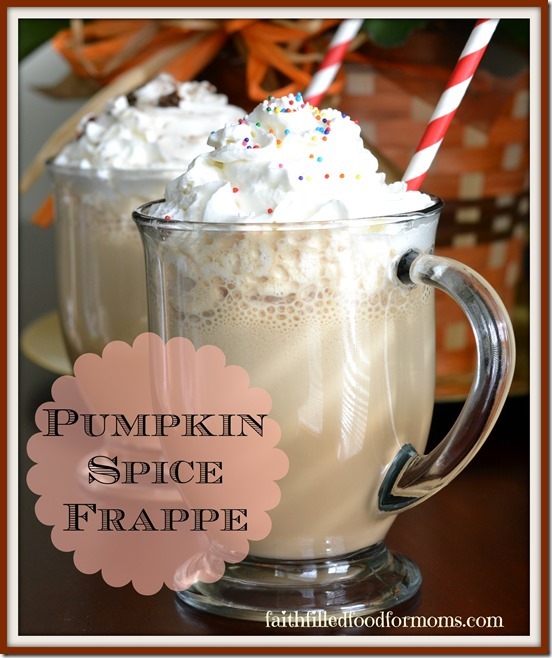 So I NEED a little pick me up…a special one! Moms need to do something special for themselves in the midst of taking care of everyone else, don’t you think?! With the hectic, crazy dis function of my young life, coffee seemed to be something that could be enjoyed over kindness, quietness…peacefulness. Unlike the wild fighting and abusive craziness that came with the alcoholism that haunted my family. Coffee was served at every family gathering. 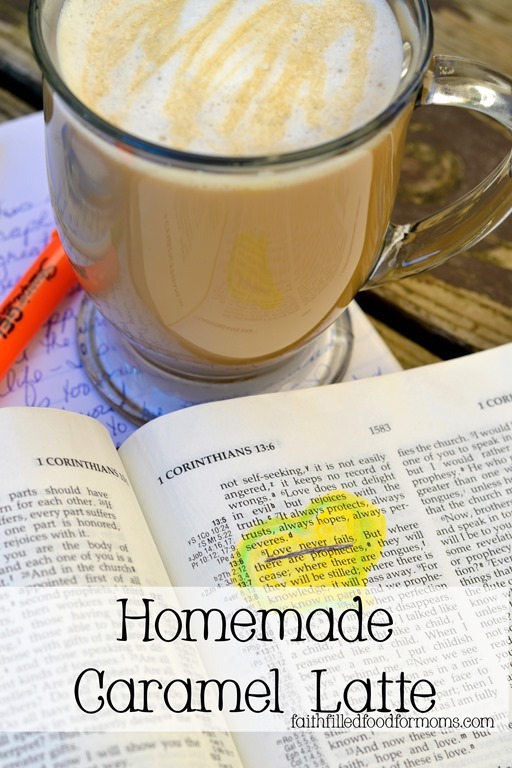 Coffee was used in special old fashion yummy recipes and one of my favorite memories of coffee was dipping my toast in coffee…my Grandmother used to let me do that. Oh I just loved that! The smell, the taste, the fellowship that surrounded the coffee…well it just seemed like something good. It was at it’s best. 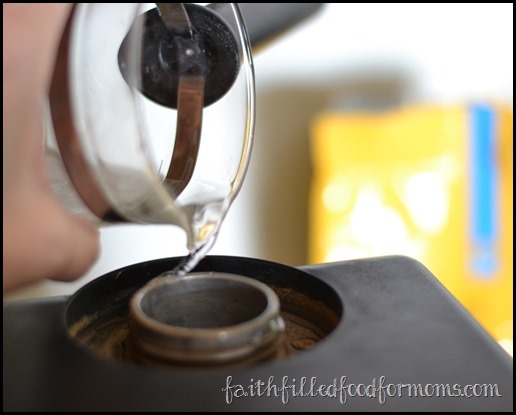 There are LOTS of ways to serve and make coffee these days! Good old fashioned percolated coffee! YES people still make it that way and it’s yummy! Many use it for camping. 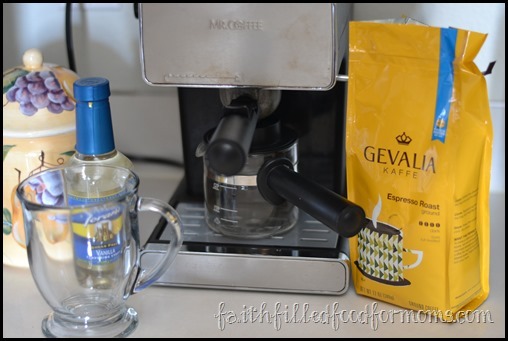 Espresso Machines ~ This is a MUST for making those yummy gourmet coffees! Don’t be intimidated…it’s SO EASY and will save you a ton of money! 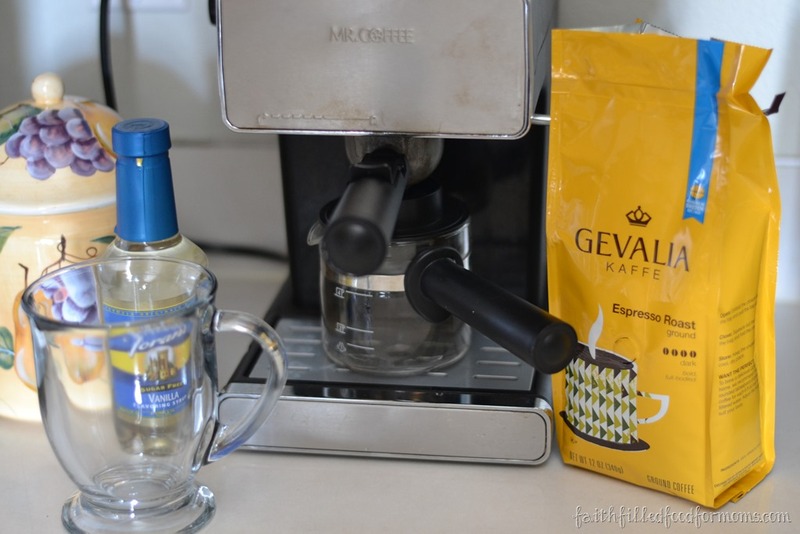 One cup coffee makers ~ such as Keurig with the k-cups. Psst there are cheaper brands, BUT Keurig is a great name brand! This is made with a simple Espresso Machine that we have had for years, nothing fancy..but deelish! 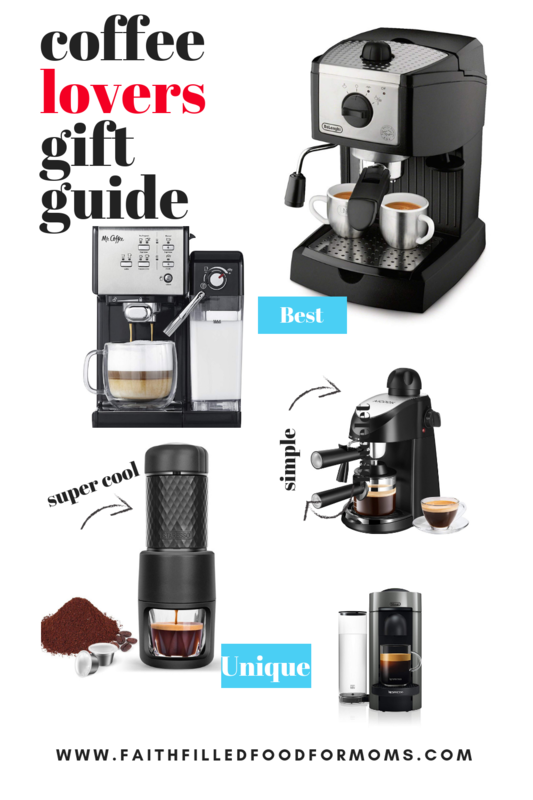 Check out this simple gift guide for Coffee Lovers and you can see there are tons of different kinds of Espresso Machines BUT they basically all do the same thing. Purchase an Espresso grind of coffee in bulk. Espresso Coffee, I use already ground coffee, but you can buy beans in bulk and grind your own with a coffee grinder! 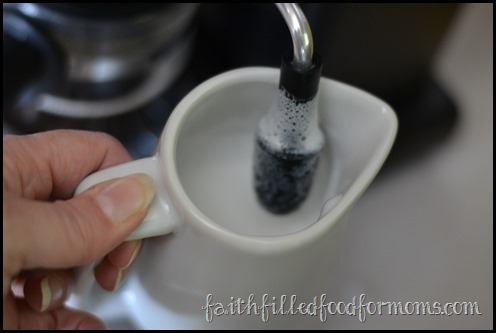 Start by filling your Coffee Filter/Container with coffee. Half is plenty for one large cup..that will make a strong 2 shots. Now replace that back into the Espresso Machine. Then add water. For one cup add up to the 2 line. However much coffee you put into the filter (i.e.. 1 shot/1 water, 2 shots/2 water) is the same amount of water as you use. Make sure and replace lid tightly. Then turn the handle to little cup. Fill your Milk to about 1/3 of a small coffee mug or carafe. Usually one comes with a machine unless you bought it at a second hand store. 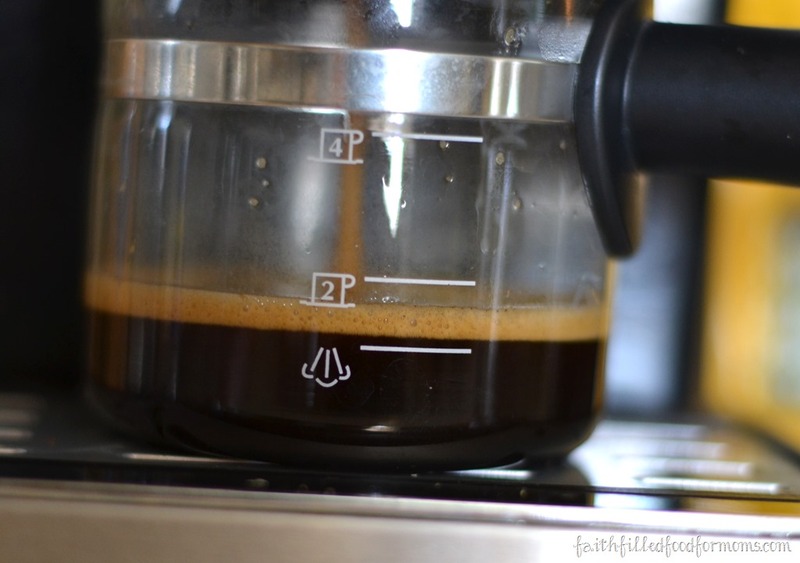 When the espresso reaches the 1 line..see that funny steam symbol? 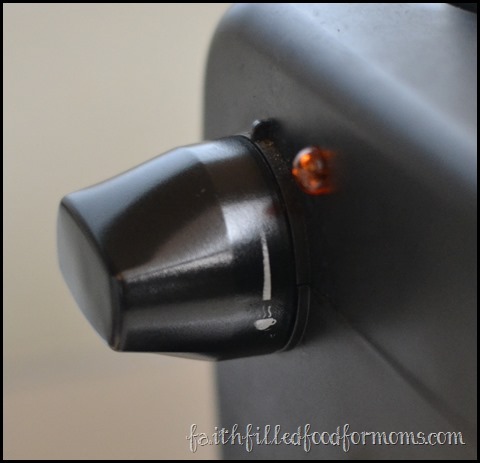 Then turn the “on” knob (you know the one with the little cup) the other way (all the way) and place the steamer into the milk..be careful..it’s steam! 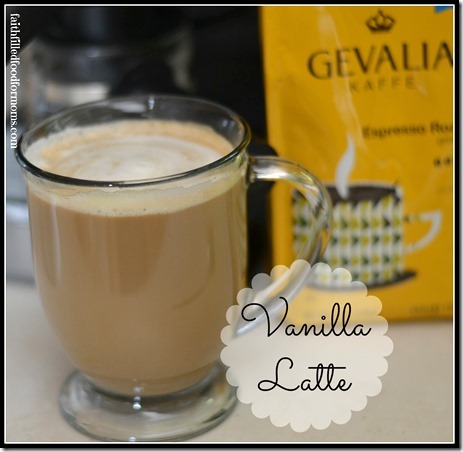 When done steaming..just add your flavoring to cup, then espresso, then steamed milk. That’s it! You can do this…you deserve it and really it only takes just a couple times to get the hang of it…It’s totally worth it! 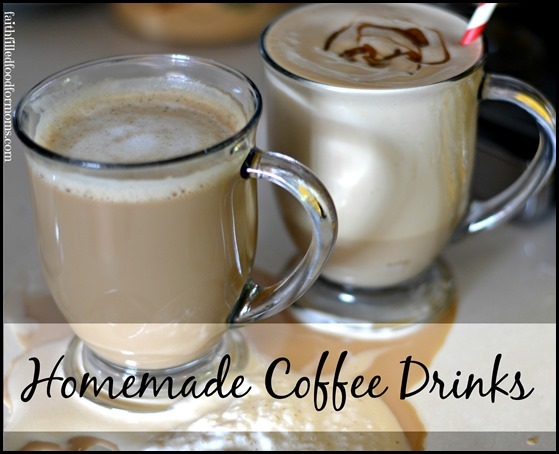 Let me know if you like to make YOUR own specialty coffee drink. If you don’t… I hope you will take the time to learn how to make espresso and make YOUR OWN gourmet coffee drinks. 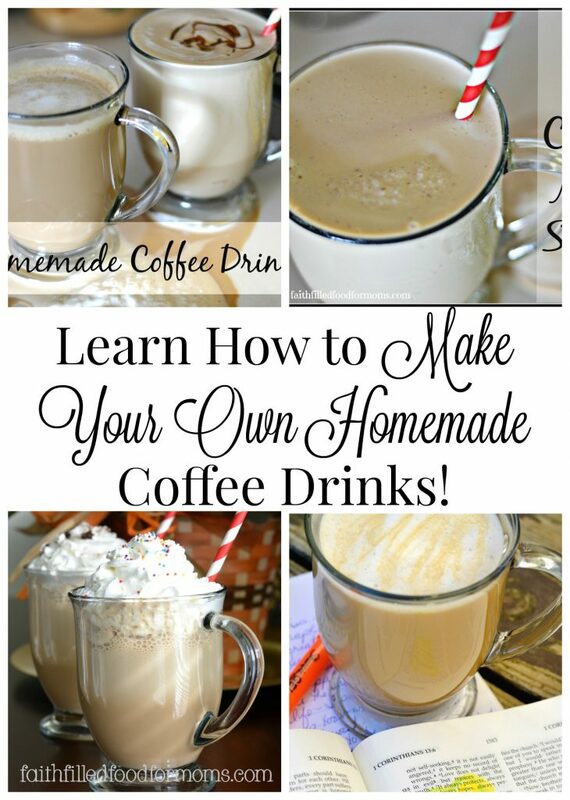 I love these delicious homemade coffee drinks recipes. I going to store tonight to get all the ingredients. What a great tip about freezing the espresso. Thanks for the wonderful post. I pinned it. I enjoy my coffee also. Your tips are great, I especially like freezing the coffee. I somehow get so busy I always forget to do this. 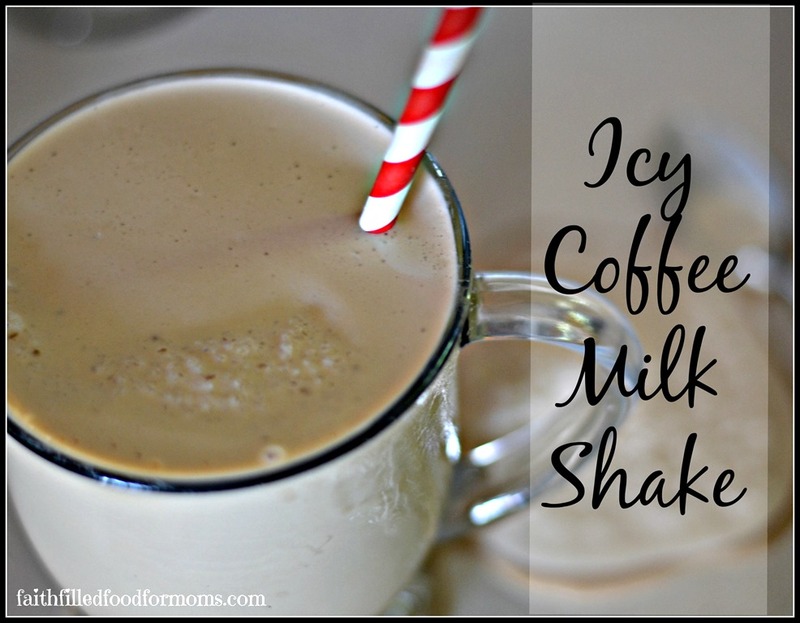 I must remember since I love iced coffee drinks in the warmer weather. I’ve pinned this and sharing G+. I am addicted to my morning latte! It throws my whole day off if I miss it :). Great tutorial, Shari Lynne. I love your idea to freeze the espresso. I’m definitely going to try that! G’day! LOVE a good coffee and am spoiled as am married to a barista! 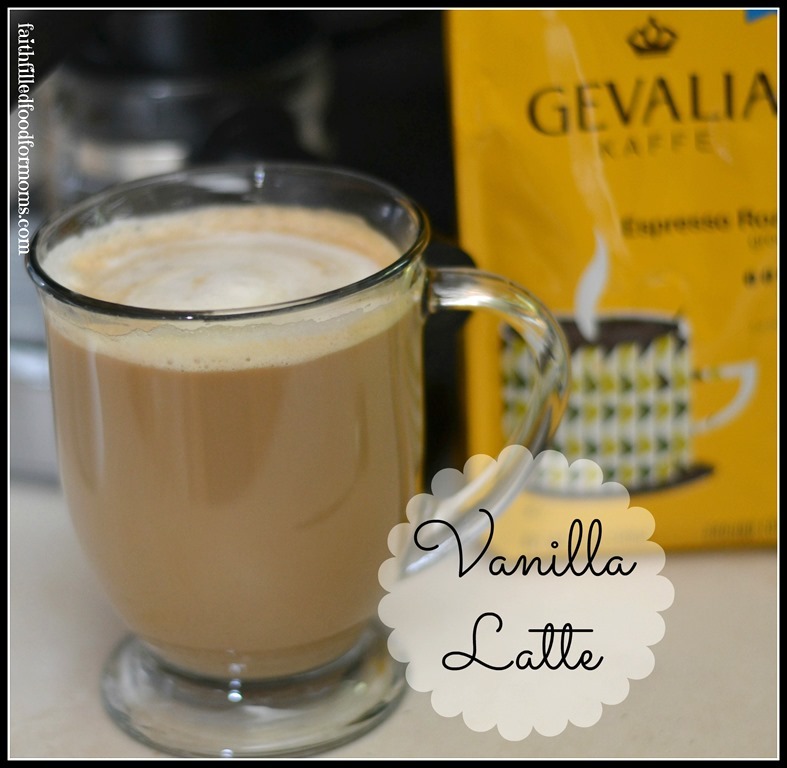 I love gourmet coffees and making them at home is so much cheaper… These sound wonderful. Thanks for sharing them on Foodie Friends Friday Linky Party and I hope that you will join us again this week for our Snack Food theme party. I’m a coffee fanatic too. What an awesome post. Thanks SO much for sharing this at our Weekend Potluck party. Please come again soon. Thanks for sharing at Family Fun Friday! I’m going to feature your post this week. I’m a coffee lover too–and into the evening as well. I grind my own beans and have a drip coffee maker. I have discovered that putting some cardamom seeds in the grinder with the coffee beans gives a delicious flavor. I also like to put about 1/8 tsp. coconut oil in my coffee. 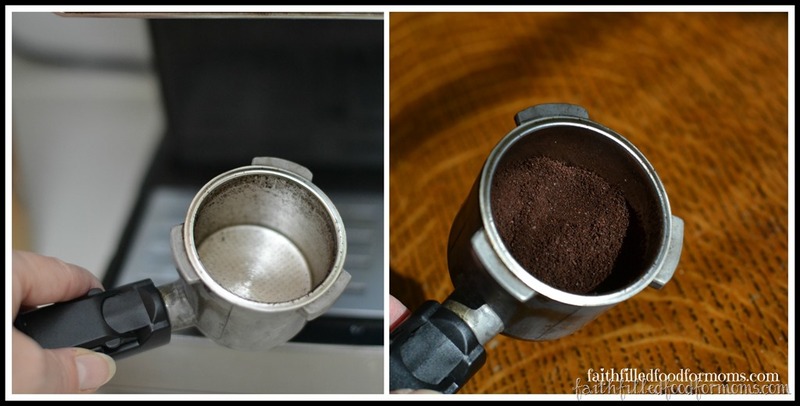 Great description and pictures for making expresso coffee. I just love coffee especially in the morning! 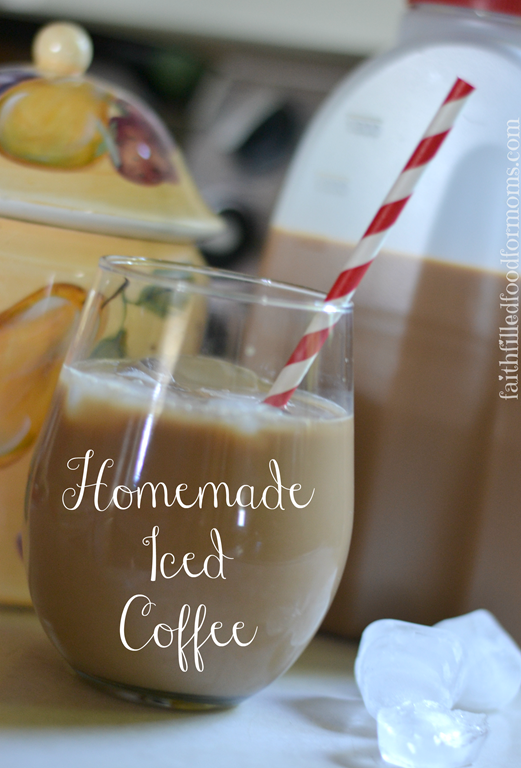 I make coffee ice cubes too! 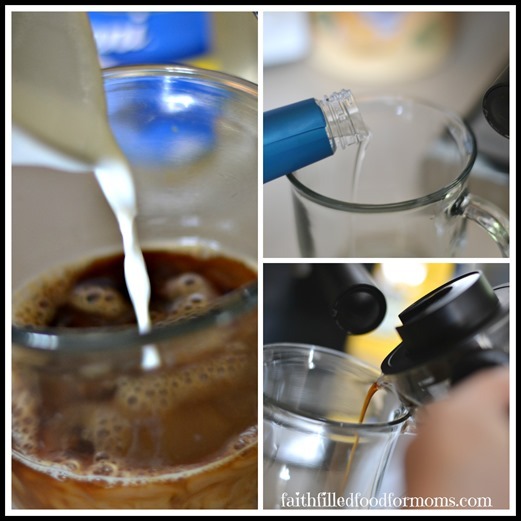 Great way to use left over coffee. I’m not a coffee drinker. But I love the aroma and I go to the kitchen at work just to smell it. Thanks for linking to What’d You Do This Weekend. These drinks seem so intimidating. You really broke it down into doable steps! Thanks! I love the ice cube idea. I like cold coffee drinks. Mmmmmm. I’m a coffee fanatic too. My mom and grandma we ALSO coffee fanatics (funny how things work out that way hey)? Yum!! with a capital Y!